I'd been holding off reviewing this for a long, long time. You see, despite being a completely modern woman I think myself to be, I sometimes fear that if I blurt out something out loud, it would stop working. You know how when you don't say anything about a budding relationship for example, an upcoming trip or a brewing opportunity? That was how I felt with the Kiehl's Blue Herbal Line. This product was recommended to me by Kiehl's specialist back at the time the Rockwell branch opened. At that time, I'd been usingHouse of Obagi's Clenziderm line --- a line that was best for oily skin, admittedly, but was too expensive to maintain. Obsessively, I was on the lookout for something to use as an alternate YET I was scared of trying something new because I'd been breaking out like crazy before that and HOO being able to fix that, I didn't want to dare bring them acne back. Martha, ever the Kiehl's ambasadress, and having been able to try this line out already, recommended that I get the entire line because I was more than just acne-prone --- I was acne-prone and oily-skinned. As I learned throughout this beauty blogging thing, gel things are our bestfriends when it comes to handling oil-producing skin like mine does. Minty feel. The cleanser was more liquid than gel-ish yet it was a luxurious product to use. It must be the camphor. I sometimes use my fingers to lather it on but every now and then I use my blue Clarisonic, too. Yum. Dry and clean. As I continuously been saying, I have oily skin and too many facial cleansers have run their muck upon my face. Cream cleansers, are apparently the bane of my existence and as I discovered with joy, regardless of the price, GEL cleansers will be your bestfriend to cut through the grease. No itchy aftermath. The problem with oil-free products is that they often leave an all too familiar tingling --- that itch you get when things are left too dry. To combat this, use a complementing moisturizer, the Blue Herbal one, for example. No plateau -- yet. It's been almost three months of using this and so far, everyday is like the first time we're seeing each other -- all potent and excited and thoroughly working. Price point is reasonable. Php 1,550 for 100 mL. Coming from the House of Obagi Clenziderm Pore Therapy Lotion, THIS was truly phenomenal. And if you know Clenziderm, you'd know it's like the king of all acne-banishing toners. After cleansing, I use this and if I'm not diligent with cleaning, I get an entire cottonball filled with oil. Yucky, I know, but that's how I know the job gets done. There's a little tingly feeling, which is how I like my toners. Perfection. Price: Php 1,036 for 100 mL. Be prepared --- this one does not feel like a moisturizer YET you know it works because you don't feel like your face itching and drying up. The problem with oily skin is that you don't need any more oil and yet one still needs to moisturize. Catch 22, yes? But this one is like dry gel. Don't be too surprised. Easily absorbed. Like Clenziderm and another favorite, Celeteque's gel moisturizer, this one was quick to be absorbed by the skin. After being spoiled by such, I'm not sure I'm ready to go back to creams any time soon. I still look 23. And I would like to thank my moisturizer for that. Thank you for NOT breaking me out and for making me zit-less the past three months. 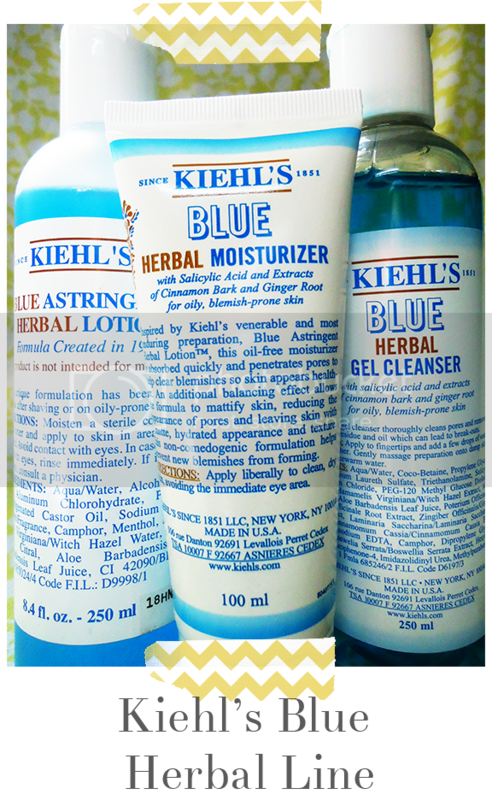 I love you very much, Kiehl's Blue Herbal Line. Price: Php 1,347 for 100 mL. Overall Recommendation: Kiehl's is all too lovely because you get samples when you buy from the store. If like me, you have oily skin, I would recommend this to you with all my might because it worked for me very well and still does to this day. I'm a very happy Kiehl's customer and I now understand why even a Japanese friend's mom uses this.Galing. Catch my daily posts via Live an Inspired Life on Facebook!